It might seem strange at this remove, but in the late 1950s there was a surprising amount of rock on television. The medium was still new, and there was a need for programming to fill it. Rock was even younger, full of energy, in many ways a natural fit, since it would draw in a young audience that wasn't otherwise being reached. The idea of rock on television really belonged to one man, Jack Good, an Oxbridge graduate. He became a rock convert at the end of 1956, when he caught Tommy Steele performing at the London Palladium. Seeing the screaming female fans, he understood the music's primal power, and how it could boost television audiences. He persuaded the broadcasting powers to air the first-ever show just for teenagers, named the 6.5 Special (a reference to its time slot, just after children's programming had ended and before the evening adult shows began). It was a revelation, the first to feature young talent. Steele was the first guest (on the third episode) when the series began in February 1957. Broadcast live, with a studio audience, the content was mostly music, but there was also a magazine feeling to it (actually the BBC had tried a magazine programme for teens, but it had been a flop). The performers mimed to their records (setting a trend that would continue on some programmes for years), but it was a show with a sense of adventure. In November 1957 it broadcast live from the 2I's coffee bar, the live home of rock in London, and even spun off an LP of artists who'd appeared on the show. It came in for constant criticism from many in the BBC, however, and was always fighting for survival. As it was, lasting until December 1958 was a triumph. Good had jumped ship before the demise, however, and returned in September 1958 with a new show, Oh Boy!, a direct competitor on ABC that was broadcast live every week from the Hackney Empire. He'd learned not only from his successes, but also his failures, and the new programme was faster-paced, one song followed by another, with different performers often singing together. It broke the old BBC rules, and no one minded. The idea was to make it fun and to appeal directly to teens, and it was perfect for that. It ran until May 30, 1959, spawning not only an LP, but also a stage show in London at the end of 1958. It gave chances to new artists, like an 18 year-old Cliff Richard, and showed that this kind of format really could work on television. Needless to say, people at the BBC had been watching carefully, and in April 1959 Drumbeat hit the air. Bandleader John Barry was the musical director, and he used singer Adam Faith regularly. However, it only ran until the beginning of September, more an experiment than a commitment, and it remains essentially a footnote to British rock TV history rather than a major entry. Truthfully, the BBC never stood a chance against Good, and his new show, Boy Meets Girls, debuted on September 12, 1959. 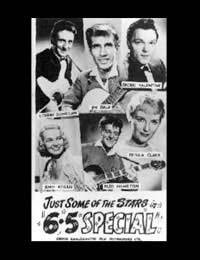 It brought in other types of music, but with Marty Wilde as a host and guests like American rockers Eddie Cochran and Gene Vincent, along with Johnny Cash, it was quite obvious where its heart lay. Instead of the Hackney Empire, this show came from a Manchester studio. It ran for several months, to be followed by yet another Good production, Wham!, which featured a young Keith Fordyce as its presenter. That wasn't the last of Good, however. At Brian Epstein's behest, he made Around the Beatles in 1964, a document of the Liverpool scene, and followed that with another important series, Shindig, that ran from 1964-66.